Shot Blasting is a metal-cleaning process during which various forms of abrasives are propelled towards a metal part at high-speeds. The abrasives remove corrosion, burrs, flash and other undesired particles from the metal, leaving the metal ready for further protective coatings or additional machining. The type of abrasive used and the recommended velocity of the abrasive will vary with the delicacy of the part to be blasted and the extent of the material to be removed. • Descaling – removal of rust, oxidation and mill scale. • Deburring – removal of unwanted sharp edges and burrs left over from the manufacturing process. 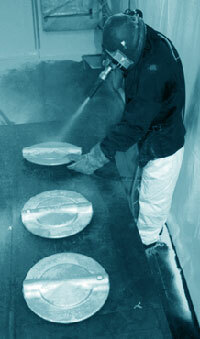 • Deflashing – removal of the excess material formed when metal parts are created using a mold. • Paint Removal – removal of old paint prior to a new coating process. 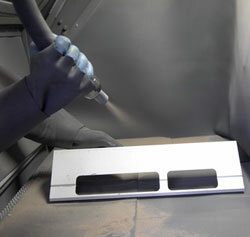 • Surface Preparation – create a uniform surface finish. Typical parts that require blasting include castings, forgings, fabrications, weldments, and heat treated parts. We remove scale, coatings, and contaminants of various steel parts without altering critical surfaces to produce a uniformly finished exterior surface.